Giugiaro styled the Techrules Ren supercar. His new project is for a car that is not so low-slung. TURIN -- Giorgetto Giugiaro made his name styling sports cars but as he approaches his 80th birthday the Italian design legend is putting comfort above speed for his latest project for a flagship electric sedan. Giugiaro is working with a Chinese company on luxury four-seat car that with focuses on ergonomics and ease of use. The reason is "because at my age acceleration and a car's top speed are no longer exciting," he said. Giugiaro plans to build a limited run of the as-yet unnamed car. 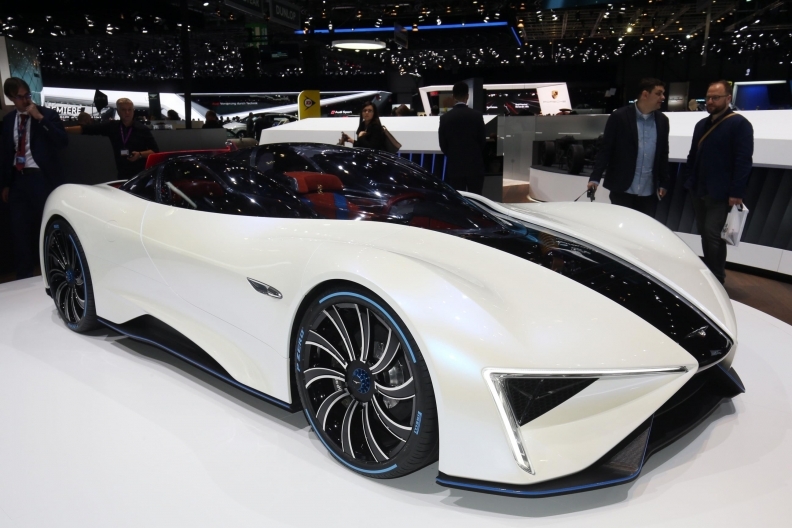 It will be 5000mm (197 inches) long, about the same length as Tesla Model S.
Giugiaro's Chinese partner, whom he declined to name at this stage, will use the sedan to demonstrate its energy storage technologies. The concept car will comfortably fit four adults with seats that are all the same size in the front and rear. It will be easier to get in and out of than similar-sized cars on sale, Giugiaro said. "Recent flagship models have been designed to be lower and sleeker and you have to bend your head to get in and out. That's something I always hated even when I was much younger," he said. Giugiaro said he began the project to create a car for his own personal use ahead of his 80th birthday, which is next August. Giugiaro admires the Tesla Model S dashboard layout but wants to improve on it. The designer is not revealing any details about the front layout, nor any pictures of the car until just before its debut at the Geneva auto show in March. He said a source of inspiration for the front door opening system came to him when he was looking at the acclaimed 1963 Chevrolet Corvair Testudo concept that he penned when he was 24. The car was driven by his then-boss Nuccio Bertone to the 1963 Geneva show. "Next year will be my 66th Geneva show," said Giugiaro, with a boyish smile. Giugiaro started as a designer at Fiat in 1955 when he was 17. During his 62-year career he designed high volume models such as the Alfa Romeo Alfasud, the first Volkswagen Golf and the Fiat Uno, as well as sports cars such as the BMW M1, De Lorean DMC12, De Tomaso Mangusta, Maserati Ghibli and Lotus Esprit. He also penned seminal flagship sedans such as the third-generation Maserati Quattroporte and the 1991 Lexus GS300, personally commissioned by then-Toyota boss Edi Toyoda. In 1999 Giugiaro was named Designer of the Century by an international jury. Giugiaro admires Tesla's Model S five-door electric sedan, which he says revolutionized interior design by regrouping all the vehicle main commands into a tablet-size touchscreen panel housed in the center of the dashboard. The design enabled Tesla to do away with the confusing array of buttons, switches and commands that swamp many modern vehicles. "Tesla's idea was truly brilliant, but its execution is not so ergonomic because the touchscreen is far from the driver," Giugiaro said. "It also has a fixed position, which is a compromise to cater for different heights of drivers." His answer is a touchscreen panel housed on the central console that the driver, and also the passenger if necessary, can move backward and forward, as well as incline and rotate to find the ideal position to operate it while keeping an elbow on the central tunnel arm rest. The same solution is replicated for the rear passengers with a second, movable touchscreen. 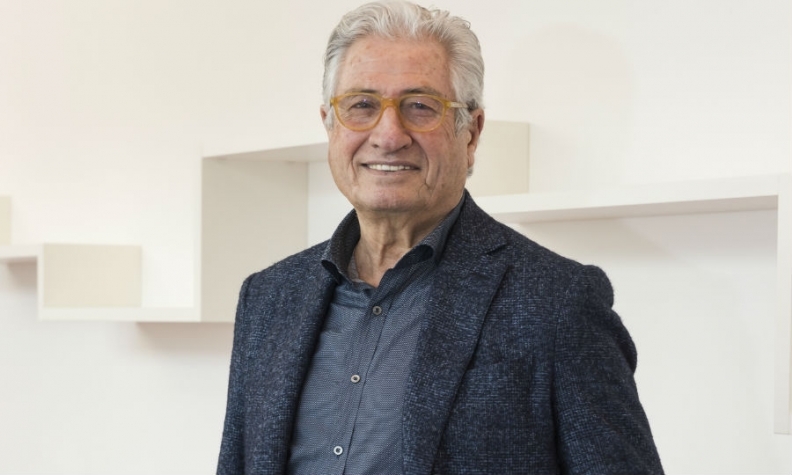 The concept will be the second publicly disclosed project for the Giugiaros' new company, GFG Style, which stands for Giorgetto Fabrizio Giugiaro. In 2015, Giorgetto and his son Fabrizio, 52, severed ties with Volkswagen Group after selling the remaining part of their Italdesign styling and engineering company to the VW Group's Audi division. GFG Style's first public project was the 1,287-hp Ren electric supercar for the Chinese startup Techrules. The aerospace-influenced three-seater designed was unveiled at this year Geneva show. Since GFG Style began operations in December 2015, the Giugiaros have designed four models signed off for production, three for Chinese automakers and one for a Japanese automaker. GFG Style can only disclose one of the customers, Landwind, which is owned by Jiangling Motors Holding, in line with clients' wishes, Fabrizio Giugiaro said. Landwind will launch its first GFG Style model late next year and a second one in 2019, he said.